A collision of world views has been on display this year in relation to the parameters of drug control as overseen by the United Nations Commission on Narcotic Drugs (CND). One issue of ongoing contention is a Bolivian proposal to have coca leaves removed from the list of substances—drugs—targeted for international control. At the present moment there is a stalemate. The proposed changes would have automatically gone into effect at the end of January until the United States and a number of other countries lodged objections, automatically halting their implementation and opening up a process of further review. Selling Coca. (Credit: Steve Willey)The controversy over whether coca leaves should be legal goes back centuries, but the current debate has its roots in the principles and powers enshrined in the 1961 Single Convention on Narcotic Drugs. Drug control under this convention has operated through the policing of the market. A drug like cocaine, manufactured in part from coca leaves, is not itself illegal. Rather the production, circulation and consumption of coca and any derivatives is regulated through monitoring its production and trade – a task overseen by the CND. This market-oriented drug control mechanism had built into it at its beginnings a bias towards industrial countries. The only legal uses of coca were for the industrial production of pharmaceuticals (cocaine hydrochloride for use primarily as a local anesthetic) or for manufacturing a flavoring extract (used primarily in Coca-Cola.) Coca leaves in their natural state became “illicit”, and the customary uses of coca by indigenous communities in the Andes were targeted for eradication, a task to be completed within twenty-five years of a country acceding to the Convention. It is this clause of the Convention which Bolivian President Evo Morales officially petitioned the United Nations to have deleted on the grounds that it criminalized Andean traditional practices and wrongly equated the dangers of drug abuse and cocaine with the valuable symbolic and physical properties of the coca leaf. “Coca sí, Cocaína no” has been a slogan of the Bolivian Government as it prosecutes a war against cocaine while trying to carve out a larger space for legitimate uses of coca. 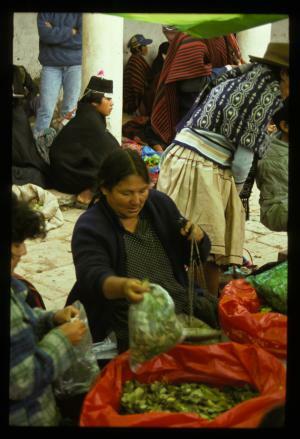 The United States has been a consistent opponent of “commercializing” the coca leaf outside of the narrow bounds established by the UN Convention. While across the Andes coca-based products seem to be on the rise (including medicines, toothpastes, foods and more) the market is severely undercut by international marketing restrictions laid out by the drug control regime. The stakes in this debate are real. Power is embedded in access to the market and is attached to racial, national and economic privilege. People seeking to cultivate, trade or consume outside of the officially sanctioned drug marketplace are rendered “criminal” whether or not their own participation is ever connected to practices or products that harm human beings. “Traditional” consumption or new coca-based commodities emerging in the Andes are all rendered precursors to the hazards of cocaine – even while coca leaves are legally exported from the region and cocaine is legally manufactured in both Europe and the United States. There is much to be said about this issue and I hope to explore it in further depth on this blog in the future. But for the moment there is one aspect to this controversy that speaks to deeper issues submerged within a public discourse that tends to describe drug control as an effort to simply police seemingly obvious categories of “illegal” activity. At the heart of this contest between the US and Bolivian Governments is a question of who gets to delineate and participate in the legal market for coca commodities—and the accompanying power this necessarily gives such a country in relation to regulating the trade. Bolivia wants a greater role and the US wants to limit participation in the interests of maintaining a system which has worked to its advantage for decades. It is a struggle over the market and marketing, one which filters, of course, through very human lives. To me this seems a profoundly limited framework, but one which interestingly has been called into question by the Bolivian Government itself when in April it adopted a radical new piece of legislation referred to as the “Law of Mother Earth.” This law explicitly rejects the notion that commercial value or market principles should dictate our relationship to nature and its bounty of resources. The earth is not merely an object to be commercially exploited, but a living entity deserving of rights and protections, the respect due to our collective mother. The Bolivian government brought this discussion to the floor of the United Nations General Assembly last month organizing a dialogue on “Harmony with Nature.” According to the Bolivian Representative to the United Nations, Pablo Solón, the initiative seeks to challenge the imbalance and disequilibrium that capitalism has wrought for the natural world. Solón explained an alternative set of principles is needed to recalibrate a more respectful and sustainable relationship to the planet, an idea which he explicitly attributed to values and traditions cultivated by indigenous communities around the world. I think such a concept may be essential for any successful effort to challenge and reconsider our contemporary system of drug control – not only to recalibrate our relationship to the earth’s natural resources, but also to one and other.